production for KU Public Safety. Upon graduation, Isa decided to roam the world taking on Germany, Italy, and Europe. Once tired with that he returned to Lawrence to work with KU’s ALTEC – Advanced Learning Technologies in Education Consortia. After approximately 5 years back in Lawrence, Isa decided it was time to telecommute to his job at ALTEC from…..Korea, Russia, Europe, Hong Kong, India, and only Isa knows where else! Isa is back in the US at ALTEC and we look forward to hearing more about his adventures. Matt hails from the middle of the Midwest, Hays, KS. He studied Film and English Lit at the University of Kansas and the University of Stirling, Scotland. Matt is truly a Renaissance guy in this industry. Refusing to specialize – Matt can conceptualize, write, shoot and edit. He is that rare combination of creative talent and technical expertise –and he’s all about telling a good story. Which, coincidentally, fits in perfectly at T2 Studios! On any given day, you might find him shooting professional athletes on green-screen, writing a script or directing an interview from behind a monitor. So what doesn’t he do? We haven’t figured that out yet. Take a look at the high quality productions Matt and company create at T2 Studios. bic media creates TV and radio commercials, corporate videos, web content, original film scores. We write, produce, direct, shoot, edit, animate, & compose — collaborating with you along the way. It’s how bic media makes the most impactful, effective work, fun. Chris is senior editor for bic media telling stories compelling enough to make you mouth water. Just take a look. Darci left us prior to graduation to serve in the United States Army Reserves in Colorado. She has returned to KU and currently works part-time in the Office of Veterans Services as well as working as a stagehand for The Lied Center of Kansas. Glad to see you finishing school Darci! After a short stint in Kansas City, Chris packed up his car and headed west in an attempt to be gainfully employed in Hollywood. After several successful position in reality tv, Chris has landed himself in an editing chair at Chainsaw, a prominent reality television production company. Good luck with the 2013 American Idol season Chris! While at KU, Sean kept talking about his desire to take a shot at creating a professional career in New York. Well for the past 9 years Sean has done just that by providing his technical skills at color correcting film and video footage for industry leaders such as CBS, MTV, ABC, and Brovo…just to name a few. Take a look at some of Sean’s work at his website. Nate continues to base himself out of Lawrence, KS when he is not working on Indie films, commercials and film documentaries around the area. Jeff has moved from Lawrence, upon graduation to seek employment in Chicago, IL. He recently landed an entry level position with a local bank in the Chicago area. Congratulations Jeff and we look forward to seeing some of your work. Bryan is our most recent grad having returned to his hometown of Topeka, KS to work as a videographer and editor for the creative services department at Advisors Excel. 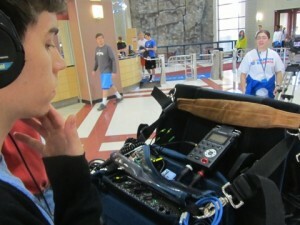 Bryan enjoys the creative process that he fist had the opportunity to experience at KU Media Productions. We wish him lots of luck in his new found position.